When Amy Martin was a young girl, she always found herself rubbing people’s necks or popping people’s shoulders. 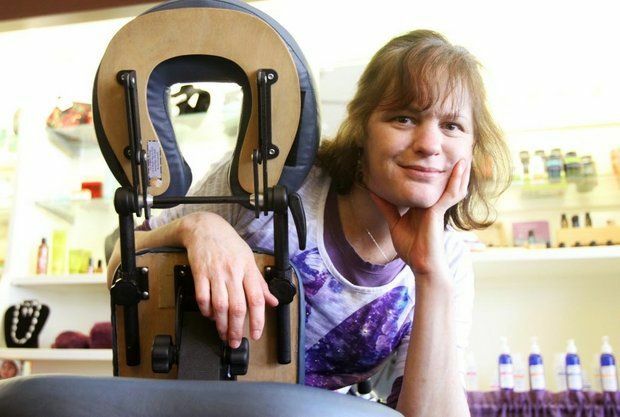 “My sisters would rub my back and I would rub theirs, and they noticed early on that I knew how to find the spots and work on them,” said Martin, owner of Woodstown Massage Boutique. “My husband is from Pedricktown, but he went out to Washington state to find himself and ended up finding me,” Martin said. Martin, her husband and now 9-year-old son moved to the area six years ago. Since opening her own massage therapy boutique, Martin has gained many grateful clients who count on her and her team for pain relief, stress relief or just relaxation. Martin’s specialty is neuromuscular, deep tissue massage. Collagen fibers, what Martin called the “body’s super glue,” binds everything together. When there is an injury, the collagen doesn’t care what it’s conjoining, it just does its job. on a client at the Woodstown Massage Boutique in Woodstown. Martin said surface scars can also be reduced with massage. Deep tissue massage allows the masseuse to loosen up the client’s muscles, through a more vigorous massage than Swedish massage which is just for relaxation. Quinton resident Ron Roll started seeing Martin once a week after he had spinal fusion surgery. Roll said he was doubtful going into massage therapy. And that is what Martin enjoys the most about her job. The Woodstown Massage Boutique has two treatment rooms and an infrared sauna which offers invisible light technique. Martin also offers Reiki massage therapy which can be done with no touching at all. She said a Reiki session can be done totally touch free or with a light touch. Martin also offers chair massage, mini treatments and hot stone massage. With all the different choices, Martin said most clients come in for pain relief. Woodstown Massage Boutique is located at 22 South Main Street in Woodstown. For more information, call 856-769-1373 or visit www.woodstownmassage.com.